You are currently browsing the tag archive for the ‘candy’ tag. 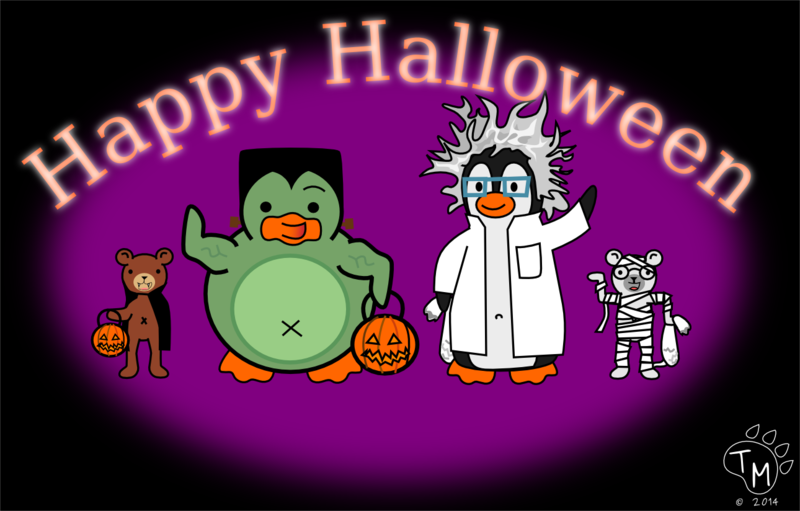 We hope you ghouls and gals have a safe and fun Halloween! Trick or Treat! DtPb Style! Easter is one of the gang’s favorite holidays. They get to dress up in their monkey suits, eat lots of candy, and search for Easter eggs! Sometimes the Easter Egg Hunt can get pretty competitive. This year was no different. The humans took the gang to a nearby park for their Easter Egg Hunt. Blizzard and Ted decided to team up this year and boy were they glad they did. They found an egg under some leaves that was almost as big as they were! Pembleton and Ducky both spied a beautiful egg near a boulder, but Ducky was much closer and was able to grab it first. Pembleton wasn’t about to give up. He searched and he searched, and he found a nice big egg at the base of a tree. Blizzard and Ted worked together to carefully roll their egg over to Ducky’s basket. But when Ducky picked up their egg, he accidentally dropped it and the egg crashed on to the ground and broke open. All three of them were upset, until they saw that inside their egg was filled with delicious candies! This was definitely an Easter to remember.